After months of on-again off-again negotiations, on December 12 the Government of the DR Congo and the M23 rebel group agreed to the terms of peace. This time it is real. The M23 had already surrendered on November 5 and declared an end to their rebellion. In March, the United Nations added to the existing MONUSCO peacekeepers a “Force Intervention Brigade”, which was authorized to conduct offensive operations against armed rebel groups in the eastern DRC. The Brigade joined the Congolese Army in direct combat against the M23 rebels in August and made quick successive military gains at the same time as the international community exerted heightened pressure on the Rwandan government to ensure it did not provide support to their Tutsi rebel brethren in the M23. Because the M23 had already surrendered, the DRC government refused to sign an agreement with the defeated and “non-existent” enemy as that might imply equality of signatories. As such, three separate peace statements were signed. The M23 signed a statement reiterating its dissolution and its commitment to pursue its objectives through political means going forward. The Government of the DR Congo signed a statement that acknowledged the M23 statement, agreed to their demand for the return of refugees; and granted amnesty to M23 rebels who had committed acts of war and insurrection, but not for those who are charged with war crimes and crimes against humanity. On behalf of regional organizations (and the international community), the presidents of Uganda and Malawi signed a third statement binding both the M23 and the DRC to fulfill their respective commitments and summarizing the 11 points contained in the two unilateral statements. What are the prospects for peace now? The Congo has known long periods without war—but they have come, with little exception, with dictatorship and severe repression. The peace we seek is a long-term stable peace rooted in democracy, rule of law, and human rights. In the Congo, the defeat of the M23 is by all. But views vary on what’s next. This agreement has been greeted with joy by the population which had long suffered from the clashes, looting, displacement of the population, use of children as soldiers, and impoverishment of the population. The M23 was a large group with support from outside. Today we buried this movement on a practical level on ground. Other rebel groups, such as the Raia Mutomboki, can no longer hinder development, as they are now without support and constitute only a small limited group. Another Pragmora colleague, based in Goma, sees the demise of M23 as only a first step on a long road to peace—he looks at the many rebel groups that continue to operate in eastern Congo, and sees a long arduous road ahead to defeat them all. The DRC has always signed accords that it does not respect. I hope this latest one will be respected. In general this agreement promotes impunity. The surrender of M23 and last week’s peace agreement clearly provide immediate relief in the areas of eastern Congo most affected by the M23 rebellion and by the explosion of inter-militia conflicts it triggered. While the end of the M23 is cause for jubilation, the peace agreement does raise some concern. The Government has traded amnesty for peace. And it’s not the first time. It’s not even the first time with these specific rebels. In 2009, the Tutsi-led CNDP rebel group was granted full amnesty in exchange for ending their insurrection. The CNDP fighters were integrated into the Congolese Army. It is these same CNDP fighters who three years later in 2012 mutinied to form the M23 rebel group. And now here they are again, asking for and being granted amnesty! Albeit this second amnesty excludes the worst offenders. This kind of ‘unjust’ agreement is the only reasonable option for peace in the Congo, but it can serve as an unfortunate blueprint for others – create a rebel group, attack innocent villagers, and surrender if “rewarded”. For a long-term stable peace to emerge, three core issues must be addressed. Each is doable. This is not pie in the sky. Peace is a realistic possibility. First, the UN’s Force Intervention Brigade must continue to work with the Congolese Army to pursue and neutralize other rebel groups. This process has already started with the FDLR—a Rwandan Hutu group that operates from inside the DRC. The FDLR must not be the end. In the past, international support for the Congo has been short-lived and has not seen the Congo all the way through the transition from conflict to full-fledged peace. Stopping part way just opens the field for new players and new violence. The UN’s Force Intervention Brigade needs the financial and political support to pursue each remaining rebel group. 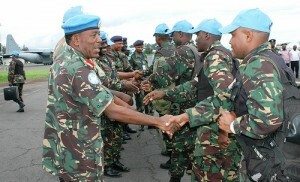 Second, the reintegration of the M23 rebels into the Congolese Army must be taken seriously. It failed last time. In 2009, the CNDP rebels were integrated into the Congolese Army. It was known that they maintained a parallel command structure outside the Congolese Armed Forces, but it was assumed that this would fade over time. Instead, in early 2011—12 months before the former CNDP rebels mutinied from the Congolese Army and formed M23—this parallel command structure was known to be strengthening and the former CNDP soldiers in the Army a potential threat. And yet, nothing consequential was done. Whatever the reasons for inaction previously, this time round the former rebels must be dealt with firmly. They must either commit fully to the Congolese Army or resign, or face consequences. And for its part, the Congolese Army must treat this recent enemy fairly, without reprisal or revenge. To do otherwise will only engender new grievances. Third, progress must be made on the issue of refugee return. This is a delicate and complex issue, but the time is now to resolve it. 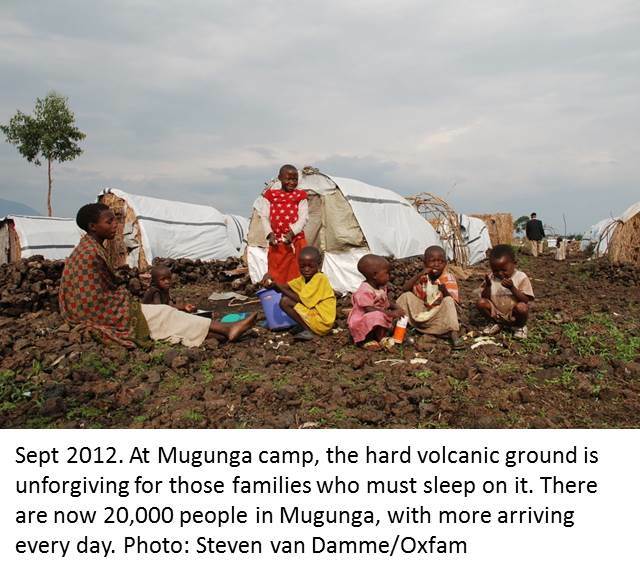 Almost half a million Congolese refugees reside in neighbouring countries. Some have been unable to return home since the First Congo Civil War began in 1996 almost two decades ago. The return of Congolese refugees harbours equally the possibility of sparking massive renewed conflict as it does of the possibility bringing a close a long-standing humanitarian issue and source of persistent anger and frustration. The problem is: where are the refugees to settle? Whether they fled violence a long time ago or in the past couple of years, many refugees have no home to return to. Communities that used to be ethnically-mixed have been ‘cleansed’ during the course of war and will not accept other ethnic groups, or specific ethnic groups, to settle in their midst. Homes and land have been redistributed or sold for ethnic homogeneity and/or for corrupt personal gain on the part of local officials. Many refugees speak Kinyarwandan and are ethnic Tutsis – although they may have lived in the Congo for generations and never lived in Rwanda other than in a refugee camp, local Congolese are quick to label them as “Rwandan”, foreigners, and the enemy. Even if the refugees can’t return home, they must be able to return to the Congo and given places to live and opportunities to earn a living. Hard decisions need to be made and President Joseph Kabila—and the international community—must be ready to make them. This is a sleeper issue of great magnitude. It cannot be ignored any longer. Today there is a fragile peace in the Congo. A constellation of events may bring a long-term stable peace to the Congo. Together, the defeat of M23, the defeat of the FDLR, the neutralization of other rebel groups, the successful return of some Rwandophone/ Tutsi and other refugees to the Congo, and free and fair presidential election, on schedule, in 2015 will create the opportunity the people of the Congo have been waiting for to begin to build their future. The underpinnings for peace are in place. Again. This time we need to follow through.